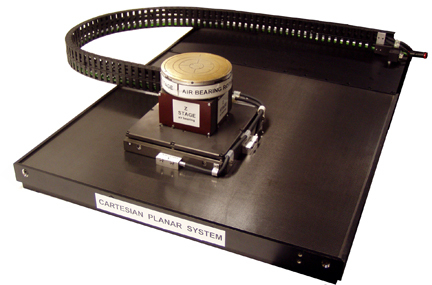 IntelLiDrives Cartesian Planar XY Table offers the unique capability to operate two axes of motion in one plane with one motor. These systems designed to replace conventional compounded XY tables where one axis is being carried by another. As a result, with the planar systems greater reliability and performance is realized through design simplification and elimination of wear-prone components. Multi axes XY-Z-Rotary system integrates XY planar forcer with air bearing Lift-Rotary Stage. Planar XY Table can operate in any orientation (side wall, upside-down) with multiple forcers installed and operated independently on a single platen for high throughput and flexibility in many robotic automation applications.